....As usual, construction begins with the lower hull tub. The biggest difference between this kit, and the Bronco Panzerbefehlswagen 35(t) that I did previously is that this kit does not have a full interior and that pylon is all the interior detail you get in the lower hull. 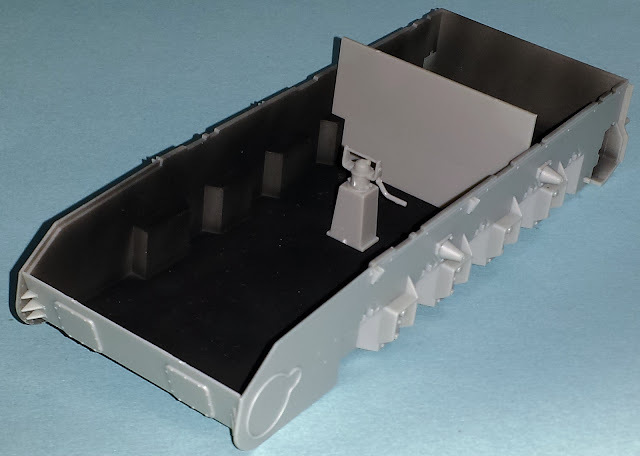 The lack of an interior is not a major problem unless you want to leave the driver and radio operator's hatches open which will then reveal the big emptiness inside. For this reason, I decided to paint the interior black and then jam some figures in the hatches with the black interior adding the illusion of depth. I didn't follow through with the instruction sequence because they go onto the suspension and road wheels, but I just went and finished with construction of the hull. 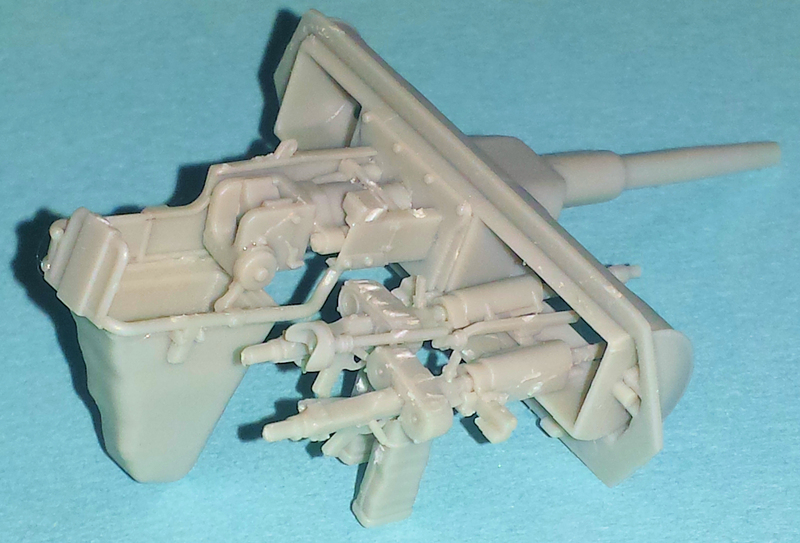 As with Bronco kits, fit of the pieces is excellent and only small amounts of filler was needed. 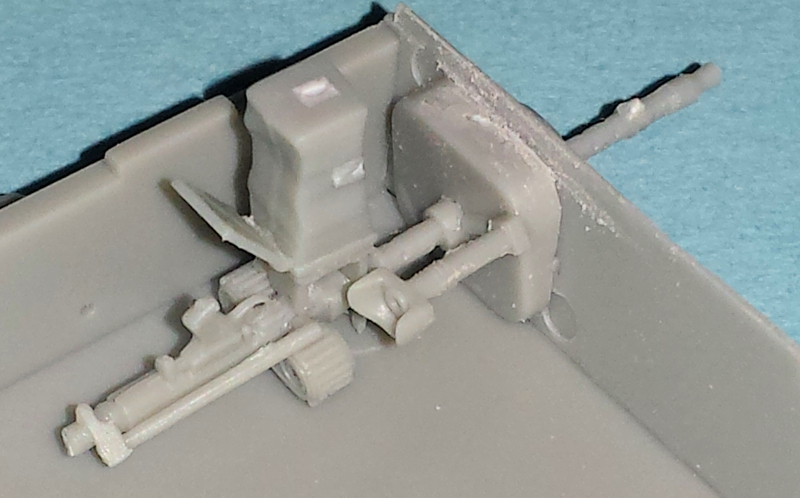 The hull machine gun has some very nice breech detail, but unfortunately invisible when the tank is viewed the right side up. Suspension detail on the hull sides is next and while the suspension arms and suspension springs are quite fiddly, they go together quite well although caution is recommended to make sure all the wheels touch the ground. The fenders and tools present not problem, and Bronco gives you the option to pose the front and rear flaps in the raised or lowered position. I chose to keep them lowered. 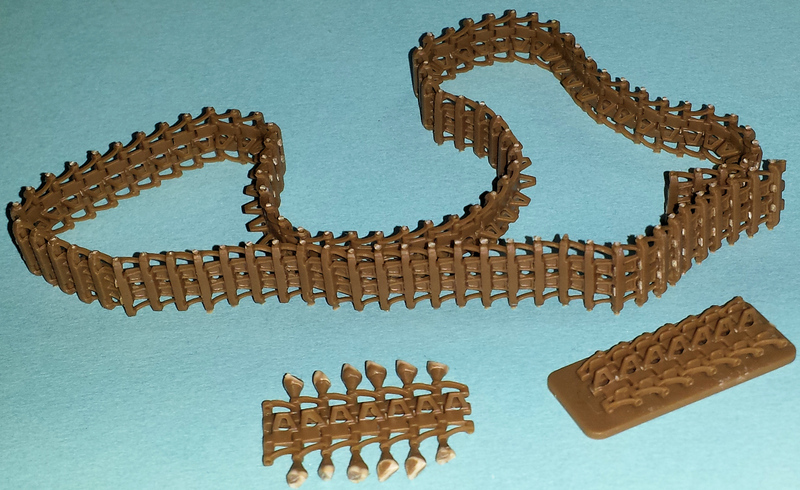 I also started working on the tracks at this stage and this is definitely the most labour intensive aspect of the kit. As the sprue shots showed, these tracks are the link and pin type which mean that if glued carefully, can be fully articulated although the instructions make no mention of this. A small jig is provided to help with construction and fits the track links perfectly, although at only seven links long, it is quite a lot of repetition when each side asks for 97-99 links according to the instructions, although keep reading. But the advantage is fully articulate tracks that sag themselves! The turret comes with a good amount of interior details with full gun breeches for the main armament and machine guns, and this will be quite visible with fairly large side hatches on the turret, although I will be painting the interior all black and putting a figure into the hatch and obscuring it all. Typical of Bronco, general fit of the kit is excellent and only small amounts of putty were needed. 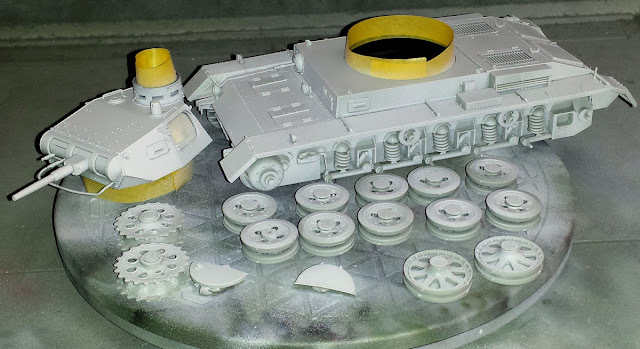 With construction of the turret complete, I did a little masking to prevent overspray into the black interior and now it is time to paint. 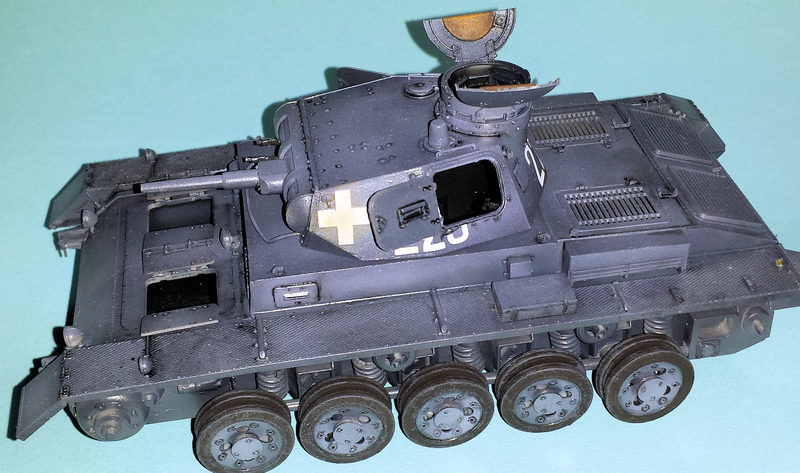 For this build, I was given this AFV Painting System by Vallejo to try out. This particular set is called Dunklegrau German Dark Grey - which is pretty self-explanatory. Step one is the Grey Primer. 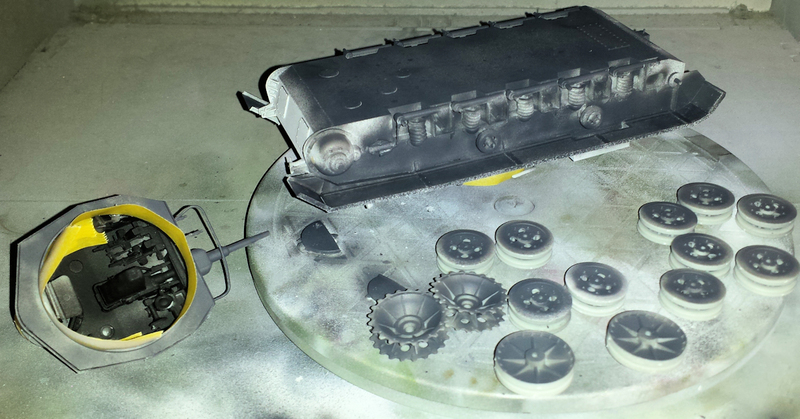 This was my first experience with acrylic primers and I did find them a little harder to use than a standard primer. Make sure you shake the bottle well to get the pigment to mix but I still found it to be a bit on the watery side. 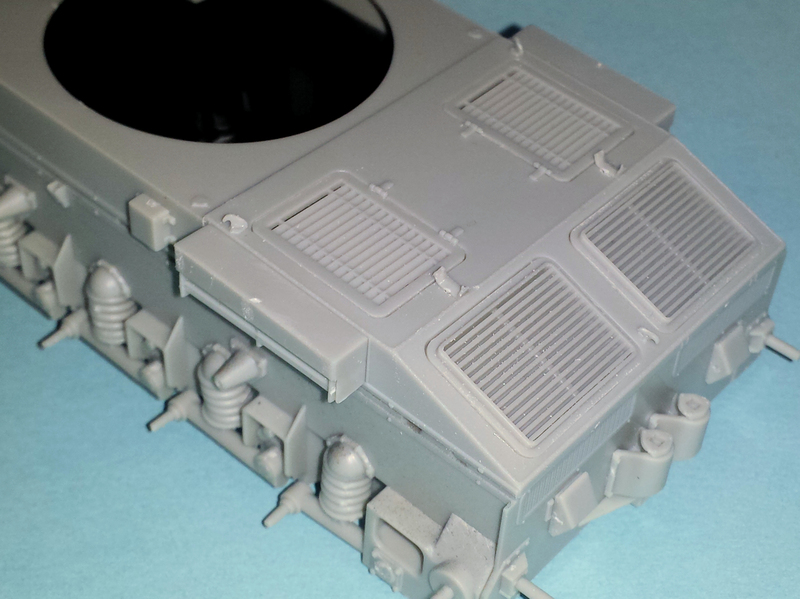 I followed the instructions and went with the Dark Grey first in the deepest areas and recessed panels of the model. The next stage is the Dark Sea Green sprayed onto the less recessed and more prominent parts, followed by the German Grey on the more exposed areas of the model. However, the difference between these two colours is very subtle, which is really what we are after and found it quite hard to get a picture of the model with the two colours on. This is the turret hatch showing the subtle differences between these two shades. Finally, Light Grey is sprayed on the raised detail panels of the model and this is the shade that really brings the model to life. However, rather than use the Satin Varnish, I chose to use my usual Pledge high gloss finish to coat the model in preparation for the decals and weathering. The variety of markings is fairly minimal for this tank but I just had to do one of the schemes with the large turret numbers. 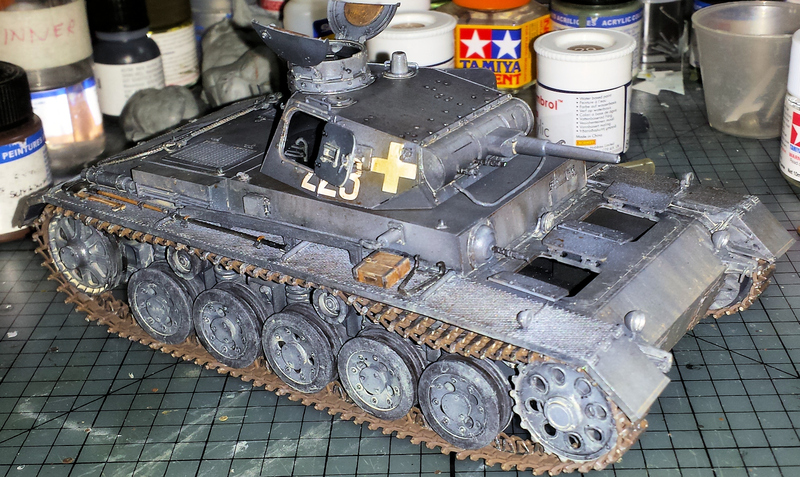 It was the tank with the dirtied white cross which took my fancy in the end which only has five decals to put on so it was a very quick job in the end. 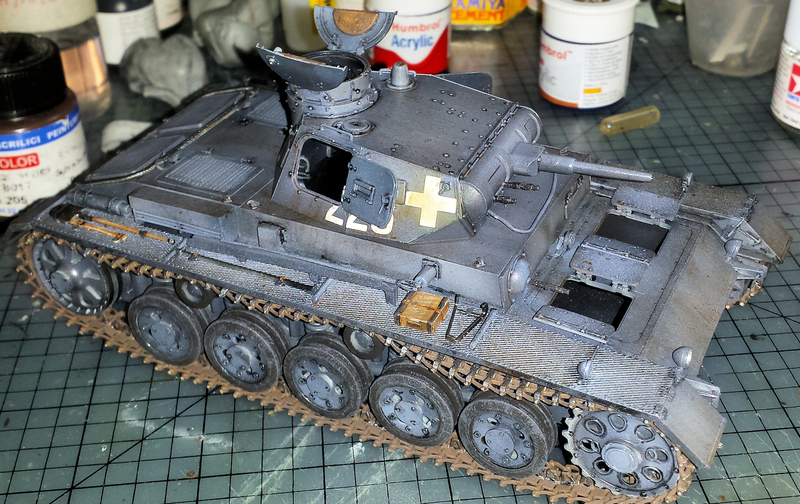 To dirty up the cross, I found Tamiya's Weathering Master to be perfect for the job and did the job within minutes, and then a quick black pin wash to bring out the details. The tracks were sprayed in Vallejo track primer and then wrapped around the running gear. As mentioned earlier, I used 96 links instead of the recommended 97-99, and glad that I didn't follow instructions. Even one link short, the tracks were still too loose for my liking and would suggest a few less. Being workable tracks, the sag formed itself naturally. 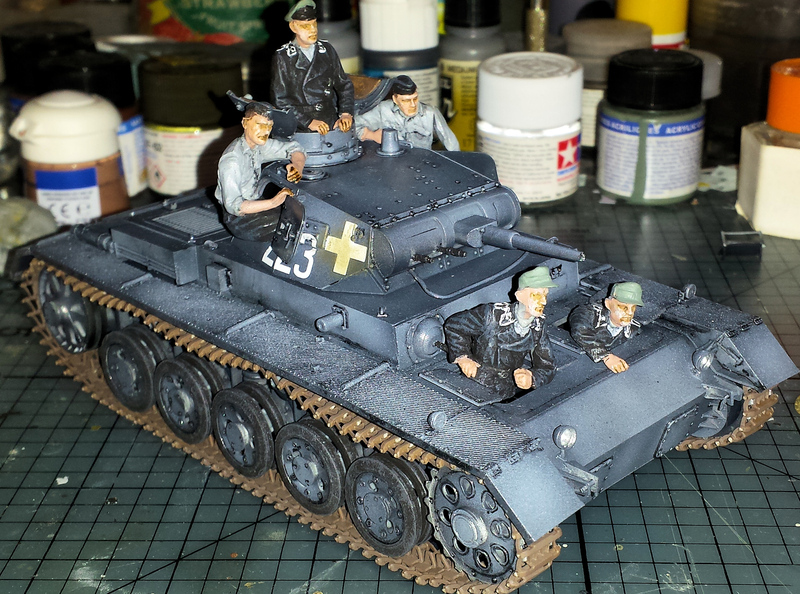 When I was first given this model to review, I immediately decided I was going to put figures on this tank and had just the perfect set of figures in my collection of figure sets, being the Miniart German Tank Crew 35003. 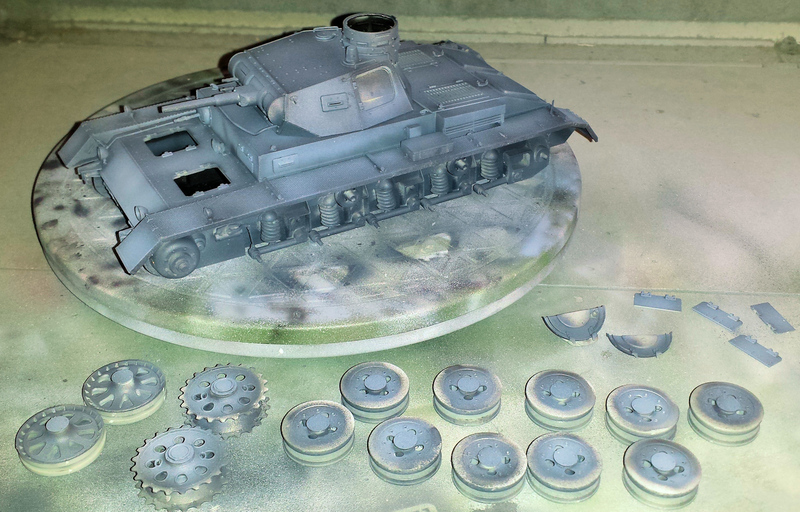 They are an older set and designed for the Panzer IV but were perfect fit. I painted the figures with a variety of acrylic paints and then did the faces with an oil wash although I still need more practice with my figures. 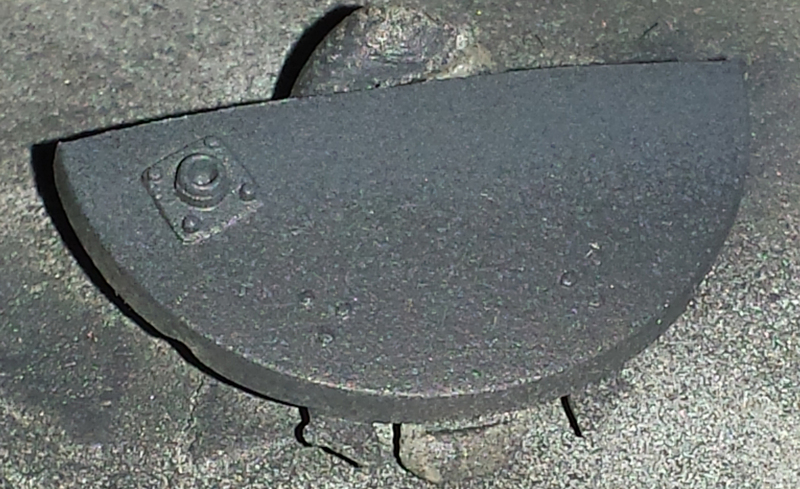 And then a good layer of dust on the lower surfaces and then picked out some selected areas. 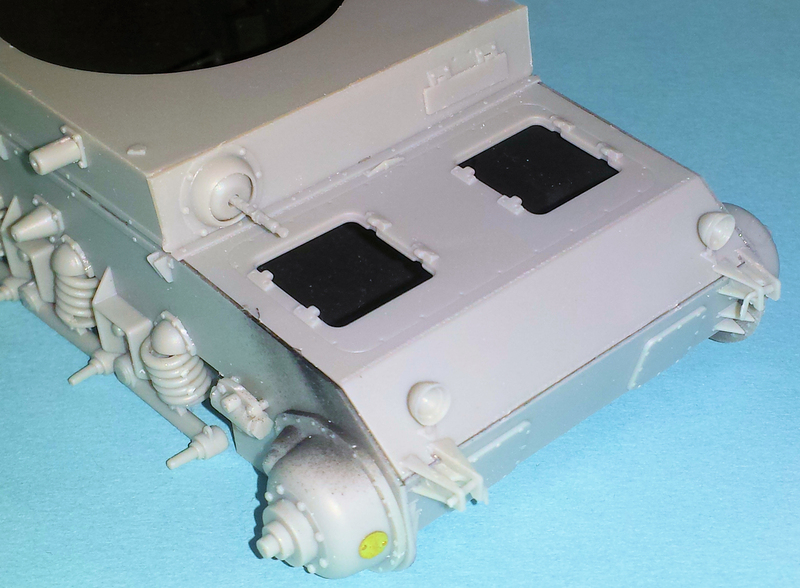 Put the figures back in the turret, and then sealing it all with a matte coat and the model is finished! I was a bit wary of Bronco and their tendency to over engineer after my experiences with the Pz 35, but this build turned out to be quite enjoyable. 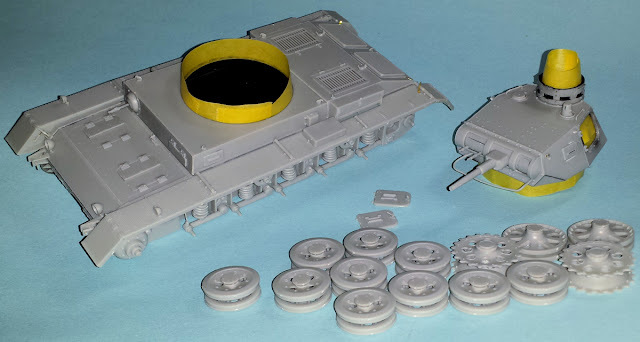 There is a disclaimer towards the end of the instruction booklet at the end of the construction sequence which reads, “This is a precision moulded plastic kit with exceptionally fine detail. It will require a little more care during assembly, but you will feel the end result is well worth the effort”. I think this sums up the model perfectly. Thanks to Bronco Models for sending this kit to review.